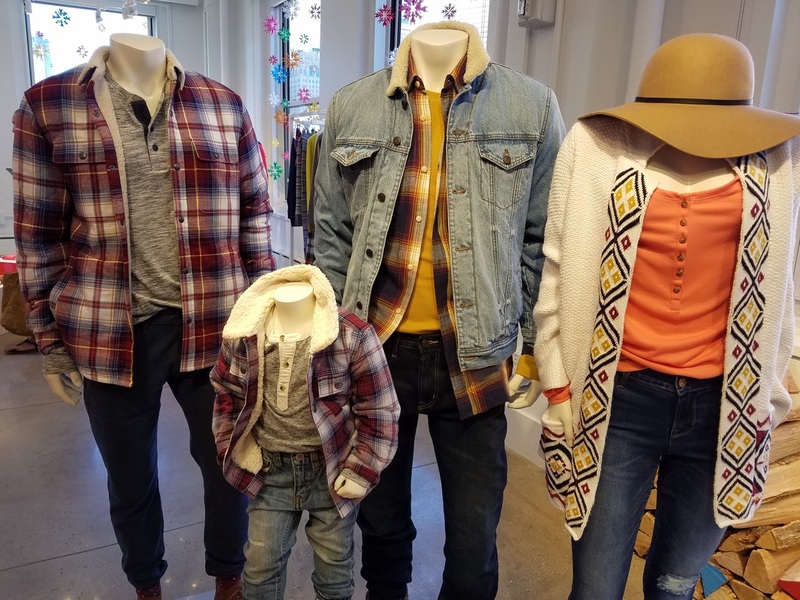 Old Navy Brings STYLE to the Holidays! Old Navy’s November/December collection is perfect for the holiday season. Some notable trends throughout the line are colored denim, Sherpa lining, matching sets, mix and match, waffle weaving, plaid, buffalo plaid, frayed jeans, fair isle print and pom-poms. There are also some items that can be considered an extension of their fall line with the nature/floral concept. Everything in the collection is under $100, making Old Navy the perfect budget-friendly gift-giving destination for the holidays. There is a casual, every-day wear collection including warm knit sweaters, flannels, denim, graphic t-shirts, sweatshirts, cardigans, button down shirts and printed pants. Apparel is available for Men, Women, Boys and Girls. Holiday themed accessories include scarves, hats and earmuffs. There is also an extensive selection of pajamas for the whole family including matching sets and mix-and match options. Cozy outerwear from parkas to puffer-vests will be available as well. These parkas are Sherpa lined to ensure maximum warmth. Outerwear will be available in vibrant and neutral colors. For the holiday season there will be am extensive formalwear selection for the whole family. For men and boys there are dress pants, sport coats, button down shirts, and nice coats. For women and girls there are foil printed damask pants, classy shift dresses, printed cardigans, heels, metallic wristlets, skirts and more. Old Navy will continue to offer their Active collection throughout the holidays too. Basic tees, sports bras, athletic jackets, headbands, hats, water bottles and duffle bags will be available.